Ja Rule's inaugural Fyre Festival in the Bahamas has been postponed after ticket holders arrived on Thursday (April 27) and complained about scenes of chaos. Fans, who were charged between $5,000 (£3,900) and $250,000 (£193,100) for tickets to see special performances from the likes of Major Lazer, Tyga, Pusha T, and Desiigner on the Exuma Cays, took to social media upon their arrival to vent about the lack of basic accommodation and bad catering at what was supposed to be a luxury event. Others, who were en route to the Bahamas from Miami, Florida, were left stranded at the U.S. airport after festival officials cancelled flights to the islands, citing "overcapacity", and promised to issue full refunds. They also acknowledged the difficulties with accommodation in a post on Instagram, but despite the early signs of trouble, which was referred to as an "unexpected start" by organisers, they vowed to press on with the festival. However, by Friday morning (April 28), Fyre bosses had had a change of heart and announced it was pulling this weekend's bash altogether. "Fyre Festival set out to provide a once-in-a-lifetime musical experience on the islands of Exuma," read a statement issued by event chiefs. "Due to circumstances beyond our control, we must postpone this experience. We are working tirelessly to ensure each guest leaves the island safely and ask for everyone's patience and cooperation as we continue to provide ongoing updates via email and our official social media channels as they become available, including refund information." The Fyre Festival, co-organised by the Holla Holla rapper and technology entrepreneur Billy McFarland, had also been scheduled to take place for a second weekend in May. Officials at the Bahamas Ministry of Tourism have since issued a statement regarding the disastrous event, insisting they are "extremely disappointed" in the "total disorganization and chaos" visitors were met with upon their arrival on Thursday. 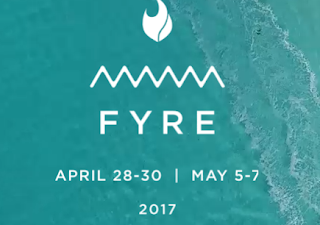 They also made it clear they are not official sponsors of the Fyre Festival, but would be on hand to aid ticketholders to get home safely. The news emerges a day after Blink-182 pulled out of the event at the last minute, citing concerns about the staging of their gig. The band said "Regrettably, and after much careful and difficult consideration, we want to let you know that we won't be performing at Fyre Fest in the Bahamas this weekend and next weekend. We're not confident that we would have what we need to give you the quality of performances we always give fans." Ja Rule finally broke his silence, saying "We are working right now on getting everyone of (sic) the island SAFE. That is my immediate concern,"
"I'm heartbroken at this moment," he continued. "My partners and I wanted this to be an amazing event. It was NOT A SCAM. I truly apologize as this is NOT MY FAULT... but I'm taking responsibility. I'm deeply sorry to everyone who was inconvenienced by this." A U.S. State Department representative also told TMZ.com they have been monitoring the situation and are "ready to provide appropriate consular services to any U.S. citizens in need".